For the fourth year running (here’s 2013’s wrap-up, 2014’s wrap-up, and 2015’s wrap-up), we’re going to keep an eye on “local” draft prospects leading up to the 2016 amateur draft. By “local” I essentially mean anyone who hails from the DC/MD/VA areas plus anyone who is playing their college ball in the DC/MD/VA irrespective of where they hail from. Here’s a list of DC/MD/VA college players draft-eligible in 2016 of note from our area. We’re now to the point where HS seniors we covered previously in this blog are becoming college Junior draft eligibles; here’s our 2013 draft wrap up mentioning a number of these 2016 draft eligible players. These are the big-time names that we’ve been hearing may be 1st or 2nd rounders this year with Local Ties. Connor Jones, UVA RHP via Great Bridge; a 1st round talent in 2013 who desired to go to college and he hasn’t disappointed; took over as the Friday starter by mid 2015, finished with a 7-2 record and a 2.96 ERA in 16 starts. 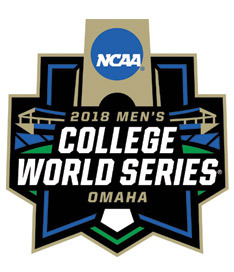 Pitched well in the CWS, getting an unlucky loss against Vanderbilt in the final. Playing in the Cape Cod league this summer, on the 2015 Collegiate National team and on the MLB.com 2016 draft short list already. Collegiate Baseball News pre-season 2nd team All-American. Mike Shawaryn: RHP for Maryland; went 13-2 with a 1.71 ERA as Maryland’s friday starter as a sophomore. He was named to Baseball America’s 2nd team All America in 2015. 2015 Collegiate National team. He could be a very high draft prospect as a junior. Didn’t pitch well for Team USA in summer 2015. Collegiate Baseball News pre-season 1st team All-American. Matt Thaiss, UVA C who led the team in hitting as a sophomore and is on the 2015 National Collegiate team. Impressed while playing for Team USA in summer of 2015, with a top-2 round projection. Collegiate Baseball News pre-season 3rd team All-American. Buddy Reed, OF from Florida via Finksburg, MD (NW of Baltimore). Not previously on the radar list despite hailing from Maryland b/c he attended a prep school in Rhode Island. But he’s playing for Florida and is on the 2015 National Collegiate team. Collegiate Baseball News pre-season 1st team All-American. Errol Robinson, SS from Ole Miss via St. Johns Prep in DC: hit .297 and started every game for Ole Miss as a sophomore. Getting a lot of attention in his junior year, with Ole Miss’ high national ranking and the general dearth of capable shortstops. Some of these guys will get drafted, others may not. But they’re all draft eligible, having gone to 4-yr programs 3 years ago. Luke Gillingham a senior at Navy who was named Collegiate Baseball News pre-season 2nd team All-American. There’s some history of Navy grads making the majors, including Mitch Harris and Oliver Drake in 2015. Charlie Gould, a rising Sr at William & Mary. Collegiate Baseball News pre-season 3rd team All-American, pre-season all-CAA. Michael Morman, a 5th year senior/grad student at Richmond. Collegiate Baseball News pre-season 3rd team All-American. Daniel Pinero, UVA middle infielder who started 60 games and hit .300 as a sophomore. Alec Bettinger, UVA RHP via Hylton: 50ip and 4 mid-week starts as a sophomore, could take a bigger role with the graduation/drafting of so many UVA arms in 2015. 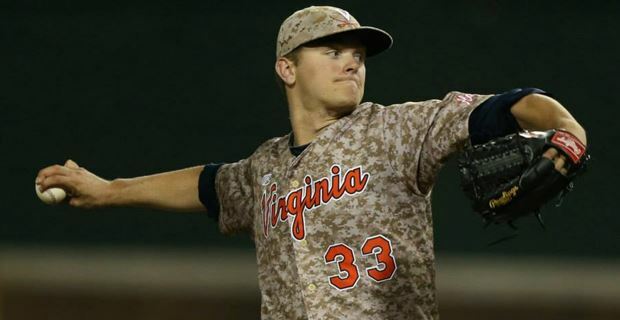 Jack Roberts, UVA RHP via James River HS: struggled to a 6.08 ERA in 23 innings as a sophomore. Andy McGuire, RHP from Texas via Madison HS: converted to middle relief at Texas, had 12 IP in 13 appearances in 2015, but does not appear to be on the Texas roster in 2016. No idea where he is now. Thomas Rogers, LHP from VCU via Lake Braddock: Initially went to UNC, transferred to VCU in the fall of 2014 and sat out 2015 per NCAA transfer rules. Will be a draft eligible sophomore. Tyler Ramirez, OF from UNC via Suffolk VA (Cape Henry Collegiate). Playing in Cape Cod league summer 2015. Aaron McGarity, RHP from Virginia Tech (home town also Blacksburg). Playing in Cape Cod league summer 2015 and made the All-Star team; prospects looking up. Andre Scrubb, RHP from High Point U by way of Woodbridge VA (Hylton HS). Playing in Cape Cod league summer 2015. Luke Scherzer, RHP from Virginia Tech by way of Midlothian VA (Powhatan HS). Playing in Cape Cod league summer 2015. Nick Walker, OF from Old Dominion by way of Chesapeake VA (Kellahm HS). Playing in Cape Cod league summer 2015. Kit Sheetz, LHP Virginia Tech by way of Midlothian VA (James River HS). Playing in Cape Cod league summer 2015. Not sure he’s actually still at Va Tech; missing from 2016 roster. David Ellingson, RHP from Georgetown U. Playing in Cape Cod league summer 2015. Andrew Yacyk, inf from Liberty U via Hagerstown. Playing in Cape Cod league summer 2015. Andrew Knizner, C from NC State via Glen Allen, VA (Hanover HS). Playing in Cape Cod league summer 2015. Nick Cieri, C/IB from U Maryland, played in Cape Cod league and made the all star team. Zack Rice: OF from UNC via Suffolk HS in Norfolk: converted to pitching at UNC: had a 2.31 ERA in 20 appearances in 2015. Bryce Harman, jr 1B from ECU via Chesterfield, VA (Lloyd C. Bird HS). Huge power potential but 1B-only guy, still projects as top 5-10 rounds in 2016. Garrett Brooks, sr OF (CF) from ECU via Chesapeake VA (Western Branch). Could be a classic round 6-10 senior sign this coming spring as a capable player who struggled early but is coming on late. Luke Bolka, jr LHP from ECU via Mechanicsville, VA (Atlee HS). Drafted late out of HS, has big K/9 numbers in small sample sizes and could easily feature as a matchup lefty reliever. 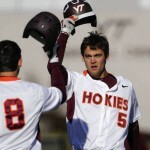 Mac Caples, jr OF from Virginia Tech by way of Midlothian VA (James River HS). Please let me know if you feel there are draft-eligible players with local ties who I should be following. I don’t want to leave anyone out! After checking in with some local prep players early in March 2013, and then taking a more in-depth look at all the local player draft prospects (with a focus on any Virginia-based player) in May, here’s how the draft ended up working out for these and a few other Virginia players (table in order of overall draft position). Couple of useful links while reading here: Total Team Bonus Pool limits for 2013 draft and Slot Bonus Values for the first 10 rounds of picks. Note that this is not an exhaustive list of Virginia or Maryland-tied players who were drafted; it is merely a list of some of the more notable names in the state pre-draft. You can surf to MLB’s excellent Draft Tracker tool for the 2013 draft and query by state, which gives you any player who has a connection to a state (whether they’re from the state or attend college there). We continue to see the drastic effects the new draft bonus limits have on team’s decisions. No longer are you seeing any high-end high schoolers taken with speculative picks in the 4th-10th round (much as the Nats picked and signed the likes of A.J. Cole and Robbie Ray). Now, if a high schooler projected to go in the first few rounds falls … he may as well fall all the way out of the draft. Consider what happened to Andy McGuire; pre-draft ranked relatively highly by pundits and projected as a 4th rounder by Keith Law. What happened? He falls to the 36th round where Colorado makes a (frankly) wasted pick on him. So McGuire is clearly going to school. Continuing on this theme, the number of college seniors and slot-signing players in the 4th-10th rounds continued to be high. A number of Virginia-based college players went in this range despite not even being in the BA top 500 list. Conner Jones is going to get his wish to go to school, falling from his end-of-1st round projection all the way to being a 21st round pick. The lesson; the penalty for picking and missing on an upper-end pick is no longer just “saved” money but “lost” bonus money, so these tough-sign high schoolers went from first three rounds to nothing. Bobby Wahl reportedly set out his bonus demands early ($1.5M or he returns for his senior season per Keith Law), dropping him from a worst-case end-of-2nd round projection all the way to the 5th. Will Oakland find the money for him or will he go back for his degree? Likely the latter. Post-script: Wahl signed for $500k. A couple of local prep players did get picked relatively high; Matt McPherson went in the 4th round to Arizona; will he take that slot money ($425k) or will he honor his University of Miami commitment? And TC Williams hurler Alec Grosser was selected in the 11th round, which has a slot value of $100,000 unless Atlanta coughs up additional dollars saved elsewhere. McPherson may want to take the money but Grosser likely could earn himself some cash by gong to school. Post-script: both guys signed above slot deals; McPhearson for $500k and Grosser for a hugely overslot $400k. The collection of high-profile Virginia hurlers who went completely unselected (the bottom names in the list above) includes a couple of guys whose lack of being picked surprised national pundits. Lastly thought on all these highly regarded prep arms not being drafted: both the University of Virginia and North Carolina made out like bandits with this draft result. All four major local UVA pitching recruits (Austin Nicely, Conner Jones, Jack Roberts and Alec Bettinger) are almost guaranteed to be going to college. And UNC’s Thomas Rogers and Zach Rice will join that squad for the next three years. The ACC should have some pretty significant pitching battles if these guys live up to their scouting reports. Post-script: only Nicely ended up signing, for a big overslot $610k deal with Houston. Despite going to Madison, I've never seen this seal until googling it. Vienna High School baseball continues its dominant ways, with the #1 DC-area Ranked Madison Warhawks and their next-door neighbor rival Oakton Cougars both taking home district tournament titles on 5/20/13. Madison blew through the Liberty District, getting a bye into the semis, winning in the semis against Stone Bridge 11-0 (with their starter taking a perfect game into the 7th) and then beating the #2 seed Langley Saxsons 11-2 in the final. Oakton beat a couple of Northern Virginia heavyweights in Robinson and Chantilly, the latter in walk-off fashion, for their Concorde District title. The wins for Madison lately have vaulted them into some national prominence. They’re #20 in the latest Baseball America top 25 poll (mostly b/c so many upper-ranked teams were dropped after losing in their state playoffs). 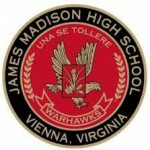 Honestly though I have a hard time putting Madison over Great Bridge HS (#22 in Baseball America), knowing what I know about that Chesapeake team (namely, Conner Jones). USAToday’s latest ranking (dated May 8th so its way out of date) has Great Bridge #17 and Madison as a honorable mention. I’m hoping for a Madison-Great Bridge state final. Update: USA Today’s 5/22/13 rankings now have Madison at #22 nationally with Great Bridge dropping out entirely due to their playoff loss to Western Branch. So much for a Madison-Conner Jones state final I guess. T.C. Williams (11-10) @ Oakton (17-4): a tough matchup for Oakton if TC Williams throws their ace Alec Grosser. Chantilly (11-12) @ Lake Braddock (17-4): Lake Braddock has high-end pitching prospect Thomas Rogers finally back from TJ surgery, adding a surprise element to this storied franchise and defending State champ. Guessing on the seeds: Madison #1, Oakton #2, South County #3 and Washington & Lee #4. Centreville #5, Langley #6, Yorktown #7, Lake Braddock #8. This is slightly different from the district final results (Centreville and Chantilly seem switched if I’m reading the bracket correctly). Madison gets an advantage by virtue of hosting its entire half of the draw plus the Regional semis and Final next week. Regional Final set for 5/31 at 6:30pm at Madison. Predictions for the tournament: all the home teams hold serve in the first round, then Oakton, South County, Madison and Centreville into the regional semis with an all-Vienna regional final next friday. Oakton v Stone Bridge: Oakton beat Stone Bridge 6-2 earlier in the season and is favored here. Langley v South County: no prior meetings between the teams, but South County is streaky and has one 5 straight. Close game. Madison v Lake Braddock: close matchup by record, no prior meeting but Madison has the advantage playing at home. Centreville v Marshall: Centreville beat Marshall away 8-4 to open the season; Centreville favored here. I’m holding to my predictions made before round 1 for the semis. Oakton, South County, Madison, Centreville. Lake Braddock takes out #1 Seed Madison 9-6 on home turf behind Dan Rogers, recovering from TJ Surgery. South County edges Langley 4-3 in 13 innings. Wow. Oakton steamrolls Stone Bridge 13-5, is now the new favorite to win the region with Lake Braddock. Marshall edges out Centreville 5-4, continuing their cinderella run. Regional Semis on 5/29/13 are set: Its now looking like and Oakton-Lake Braddock regional final. 5/29/13 results: Indeed both Oakton and Lake Braddock won easily and both advance to the State tournament. Lake Braddock d Marshall 16-5. Regional Final: predicting Oakton but wouldn’t be surprised either way. 5/31/13 result: Lake Braddock batters its way to another Regional crown 14-7. With the Regional losses for both Great Bridge and Madison, both teams have now dropped out of top-25 rankings in BaseballAmerica and USAToday‘s early June rankings. Great Bridge and now Lake Braddock are Honorable Mentions in USAToday, implying a top 50 national ranking for now. Weird how Great Bridge loses early in its own district tournament but still advanced to the Regional tournament, which it subsequently looks to win. State Quarter finals to be held Tuesday 6/4/13: Lake Braddock v Patriot, Oakton v Hylton, Freeman v Great Bridge and Hanover v Kellam. The semis and final are at Westfields High School friday and saturday Jule 7-8th. Great Bridge d Freeman 3-0 behind Conner Jones’ 3-hit shutout. Lake Braddock edges Hanover 5-4 behind 5+ innings from Thomas Rogers. Hanover blanks Kellam 5-0 behind UVA commit Derek Casey‘s shutout. Oakton edges Hylton 4-3 in a bullpen-by-committe approach. State Semis are Friday 6/7/13 at 3pm and 7pm. Semis and Final Results: Both NoVa local teams were beaten in the State Semis, setting up a Great Bridge-Hanover state final. In the state final, Richmond area Hanover prevailed over a Conner Jones-less Great Bridge 3-1. Despite a 5-run lead on Friday night against Lake Braddock, Great Bridge left Connor Jones throw 2 2/3 innings in the semi, leaving him ineligible to appear in the championship. This seemed like rather questionable stragegy, considering the way Hanover used their ace Derek Casey to save the friday night game and to pitch the bulk of the state championship game. If you’ve never heard of Casey, you probably will next year. Only a junior, he’s already up to 93 on the gun and has an early UVA commit. I’m sure about this time next year we’ll be hearing about Casey’s draft value. Congrats to Hanover and Derek Casey for a 2013 Virginia State Baseball Title. High Schools are heading into post-season tournaments and local prep players have had their chances to make impressions through the Spring HS season. How are our local prep phenoms faring this year, and what players with Virginia ties may feature prominently in the upcoming MLB draft? Note; it is difficult to find updated stats on Prep players. I tried. If you know where to find reliable prep hitting and pitching stats, let me know. So there’s not much in the way of stats here unless they’re college players. For all the players below I’ve listed if they appear in the latest top-100 draft prospect rankings from two reliable sources: Keith Law‘s top-100 draft list and BaseballAmerica’s top 100 list and top 250 list. Instead of re-linking over and over, i’ll refer to these two lists in shorthand via the links here. Andy McGuire: SS/3B: leading Madison HS in Vienna to a 19-1 record (with 19 consecutive wins) heading into the District tournament and a #1 local ranking by the Washington Post. Madison is also an honorable mention in the latest USA Today national rankings. I asked Law in his 5/16/13 chat about McGuire’s draft status (he’s regularly in the lower 50 of pundit’s top 100 draft prospects for this year, implying a mid 2nd round pick) but Law is “hearing” 4th round, which he’s surprised by and may indicate that McGuire will honor his U. Texas committment. Draft Rankings: Law #74/BA #196. 6/6/13 update: some video of McGuire at this link; just watching him run and move and his body type I’m immediately thinking he’s going to struggle to stay at SS, echoing what scouts say. Alec Grosser: RHP TC Williams: Nothing else has really popped up about Grosser after the initial flurry of articles, and he’s listed as “Signed” and committed to George Mason. PerfectGame has his best measured fastball at 92, ranging 89-92. That’s still pretty good and I’m guessing he’ll head to George Mason to see where his arm takes him. His HS has not had the success one would expect with a dominant arm, sitting at around .500 heading into the post-season. Not ranked by Law/BA #158. Matt McPhearson: OF with Riverdale Baptist popped up on MinorLeagueBall’s Mid-Atlantic report recently with the note that he has “game changing” speed. He’s still listed as a “Verbal” Commit to U. Miami. I’ve seen him as a late 1st rounder on some mock drafts. Here’s a good scouting report on him from BaseballHounds.com. Lastly there’s some scouting video online of him, showing a good bat from the left-hand side and with some amazing speed stats: a verified 6.2 in the 60 yard dash and home-to-first in less than 3.8 seconds. As the articles say; that’s Crazy fast. He’s one of only three guys with an “80” scouting grade in this year’s class per Jim Callis (the other two being Jonathan Gray’s fastball, and Kris Bryant’s power, and those two guys are both going in the top 3 of the 2013 draft). The only knock on him may be his size (just 5’10”) but he profiles as a prototypical leadoff/center fielder. Law ranked #62/BA #136. Thomas Rogers, LHP injured all year is still verbally committed to UNC. Nothing new to report. Not ranked in either Law/BA’s lists. Errol Robinson, SS from St. Johns, signed to play at Ole Miss. He was #92 in BaseballAmerica’s top 100 pre-season draft prospects and had a nice Q&A with them in March 2013. His PerfectGame profile and draft write ups indicate he’s a quick-bat SS who has the capability of going in the top 5 rounds. NatsGM’s Ryan Sullivan scouted him about a week ago and wrote it up here. Based on this interview (where he talks about how his Mom, Dad and sister all attended or currently are at Ole Miss), I’m pretty sure he’s going to honor his college commitment despite any potential drafting. Not ranked in either Law/BA’s lists. Alec Bettinger, a RHP with Hylton HS in Woodbridge, has a verbal commitment to UVA. PerfectGame has him with about a 90 mph fastball. He’s “small but athletic” per this MinorLeagueBall article (6’0″ 165lbs), which may have him leaning towards a future professional bullpen role. 6’0″ is really on the low-end for what scouts like to see in a starter (think Tim Hudson is considered undersized and he’s 6’1″ 175lbs), so it seems likely he’ll take his fastball to college to see how it develops. Not ranked in either Law/BA’s list. Conner Jones, RHP with Great Bridge HS, the HS of Justin Upton down in Chesapeake. Jones is leading his HS to a current 19-0 record, good enough for being ranked 18th by USAToday/22nd by BaseballAmerica in the state title game. He’s easily the best Virginia draft prospect this year and is the only guy that MLBDraftInsider.com has going in the top 50 of their mock drafts right now. PG has him at 93mph with a UVA committment that he has told scouts he intends to honor, but he’s getting back-of-the-1st round notice for the upcoming draft. As scouts have noted, these “verbal commitments” are pretty meaningless unless a player specifically fails to file one specific item prior to the draft (which automatically invalidates them; i can’t recall what it is right now but believe its a drug test). So we’ll see. Law ranked #29/BA ranked #33. Bobby Wahl: RHP from Ole Miss, a good sized Righty who is Ole Miss’ Friday night starter and who hails from Springfield, VA (West Springfield HS). He’s 9-0 with a 1.43 ERA on the season, quite a stat line considering who he’s typically going up against (the #1 starters of other SEC teams, easily the best baseball conference in the land). Law ranked #66/BA ranked #36. If he last til the late 2nd round as Law suggests, he could be right around where the Washington Nationals could draft him with their first pick (#68 overall). However, John Sickels/MinorLeagueBall’s latest mock draft has Wahl going #31, more consistent with BA’s rankings. It doesn’t seem likely he’ll fall to the Nats. Austin Nicely, LHP from Spotswood HS in Grottoes, Virginia (way down I-81 by my alma Mater James Madison University). PG has him as a lefty who throws 90 and is committed to UVA. Law #78/Not in BA’s top 250, a huge disparity. 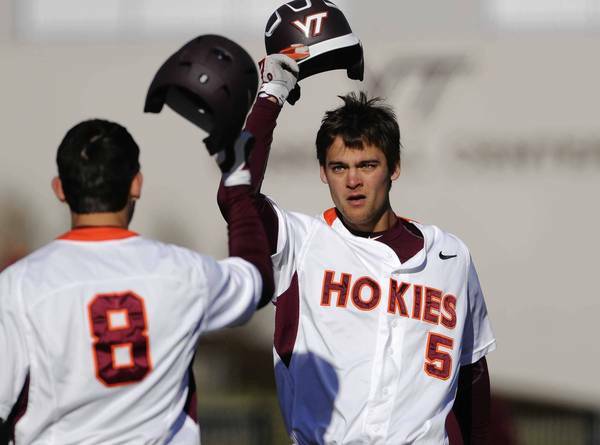 Chad Pinder, 3B Virginia Tech. Described as a plus-defender, decent bat. His season batting stats aren’t that impressive as compared to his teammates, so he must be some defender. If he can really move to SS like the scouting reports say and still hit for average and some power, he’s a good 2nd-3rd round prospect. Law ranked #86/BA ranked #53. Jack Roberts, RHP from James River HS in Richmond, committed to UVA and per PG gets up to 92mph. Big guy (6’4″ 200lbs) who I’d bet can add more velocity if he goes to college. If he threw a couple ticks higher he’d probably be a big time prospect. Not ranked in either Law/BA’s list. Zach Rice, LHP from Suffolk (outside of Norfolk), tall lanky kid who slings it 89 from the left hand side. Committed to UNC. Worth mentioning since he’s been recruited by the best team in the country. Not ranked in either Law/BA’s list. Kyle Crockett, LHP from UVA. He’s UVA’s closer (and a HS teammate of fellow draft prospect Chad Pinder). He throws 90-92 from the left side but has impeccable control; he has just one unintentional walk in 43 innings this year while getting more than a K/inning. Despite being used as a reliever, I can see someone moving him back to the rotation to see if his stuff can play for 6-7 innings at a time. Not ranked by Law/BA #103. Conclusion: Looking at this list, UVA stands to lose an awful lot of pitching recruits if these guys don’t honor their commitments. Bettinger, Jones, Nicely and Roberts are all UVA commits. But imagine that staff in a couple years if they all go to college. Phew. There’s not usually a lot of buzz around baseball prospects coming out of High School in the DC Metro Area, but this year we’re starting to hear things about a couple of local players. Here’s a quick preview of these two local phenoms who may be making news in June’s Rule-4 draft plus links for a few other good local prospects. First is someone of particular interest to me, having graduated from James Madison High School in Vienna. Senior shortstop Andy McGuire was named to Baseball America’s 3rd team pre-season All-American team and has routinely been placed on top 50 draft prospect lists (projecting perhaps as a 2nd rounder). He was on the 2012 Under-18 USA team which won the world title last fall in Asia. He’s committed to play for the University of Texas for now; we’ll see what happens if he gets offered a decent bonus by his drafting team. He’s 6’1″ 190lb and some reports say he may not be able to stay at Shortstop (though I don’t see why when such athletic shortstops as Troy Tulowitzki and Ian Desmond are both taller and heavier and play premium defense at the position). Obviously his value is higher at this position as opposed to moving to 2nd or 3rd. He struggled last season with a hip issue that eventually required surgery; it should be interesting to see how he performs this spring and whether he can raise his draft stock enough to sneak into the first round. If you’re interested in more information, Perfect Game has a ton of information on him here. Meanwhile, this AllMetSports.com article popped up this week about T.C. Williams hurler Alec Grosser, who showed up at a showcase game and was sitting in the low 90s, touching 94-95 with a wipeout slider and great movement. Suddenly this unknown has put himself in a position to have nearly every team in the majors sending scouts and cross-checkers. He has an ideal starter’s frame; 6’4″ and 195lbs with room to pack on muscle, which has scouts more than excited. He’s committed to George Mason for now but has the whole spring to showcase his talents and possibly move up draft boards. Matt McPhearson, a speedy leadoff/lefty outfielder for local power Riverdale Baptist with a committment to college powerhouse Miami. Scouting reports from PerfectGame.org say he could be drafted in the first 5 rounds. Not a slap hitter but a line-drive hitter with some power for his size (5’10”). Thomas Rogers, a senior LHP with defending Virginia state champ Lake Braddock could hit 89 from the left hand side before suffering a TJ injury; he’s committed to UNC and probably will end up there (instead of the draft) by virtue of missing most of his senior year on the mound. If he can get that velocity back and perhaps hone it while at UNC he has a chance to be an impact player some day. A good list of eastern regional prospects from Virginia and neighboring states can be found here, at the 2013 Rawlings/Perfect Game pre-season All Atlantic Region teams. There’s plenty of guys in the area with college committments; the guys mentioned on above are the ones who sound like they’re possible draftees or who are committed to “marquee” college programs.